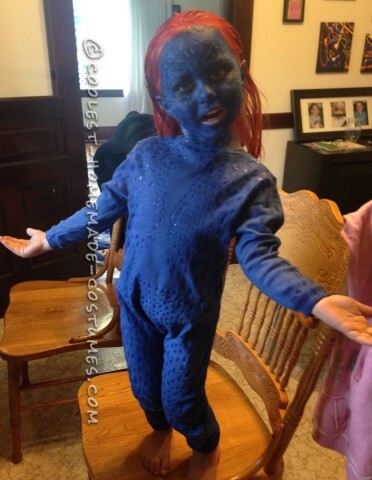 My little one loves Marvel and wanted to be Mystique, but there was no Mystique Halloween costumes to be found. So we made one! I started off with a white onesie and bought some blue fabric dye. I wanted it to look like a body suit so I made her wear it backwards with the zipper at the back. I then used 3D puff paint to make the scales all over it. Next, we sprayed her hair with the red Halloween hairspray. We had my daughter wear blue gloves instead of painting her hands and got blue socks that would fit over her shoes and BAM… Mystique was done.